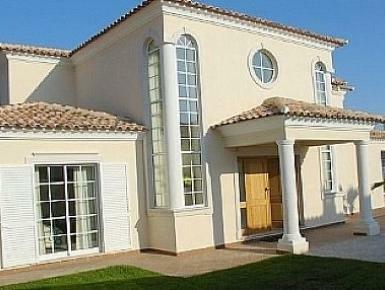 This is a five star villa in a fabulous setting of over 3,000 square feet, with contemporary luxury furnishings. It is located between Quinta do Lago and Vale do Lobo which are two of the most sought after resorts in the Algarve and only a few minutes from spectacular beaches. There are four bedrooms all of which are en suite. The master bedroom has a king size bed tv and dvd player and two balconies. There is a double bedroom and a twin bedroom both with patio doors leading to the garden. The other twin bedroom has balcony. This villa comfortably sleeps eight adults. including sports channels. There is a fabulous dining area with seating for eight people. The kitchen is fully equipped with american fridge freezer, dishwasher and microwave and you can access the garden through the patio doors.